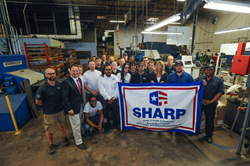 On May 18th, 2015, the Occupation Safety & Health Administration (OSHA) recognized Marlin Steel as a provider of exemplary safety for workers by making Marlin Steel the fifth company in Maryland to earn the Safety and Health Achievement Recognition Program (SHARP) award. This award was presented by Kelly M. Schulz of the Department of Labor, Licensing and Regulation in a ceremony at Marlin’s newly-expanded Baltimore factory. See more details about the award here. How did Marlin Steel earn this award? Rather than simply telling employees about new safety standards and practices, Marlin Steel encourages active participation by employees. By giving employees a say in the creation of new safety standards and practices. A safety committee with actual factory workers helps oversee the creation and implementation of new safety protocols. This way, new safety rules benefit from the perspective of a front-line worker who knows the potential dangers that they and others work with. The knowledge that these rules are reviewed by their peers helps employees to take new rules more seriously. Additionally, experienced front-line workers may be able to spot issues in new regulations that might get in the way of productivity or actually make safety worse. Years ago, Marlin Steel made commodity baskets using hand-assembly methods. Not only was this slow and inefficient (a good worker might make somewhere between 12-20 baskets a DAY), it was inherently dangerous to bend and cut steel wire with hand tools. Employees who bent wire by hand sometimes lost fingers or eyes to accidents on the factory floor. This situation was, in a word, unacceptable. 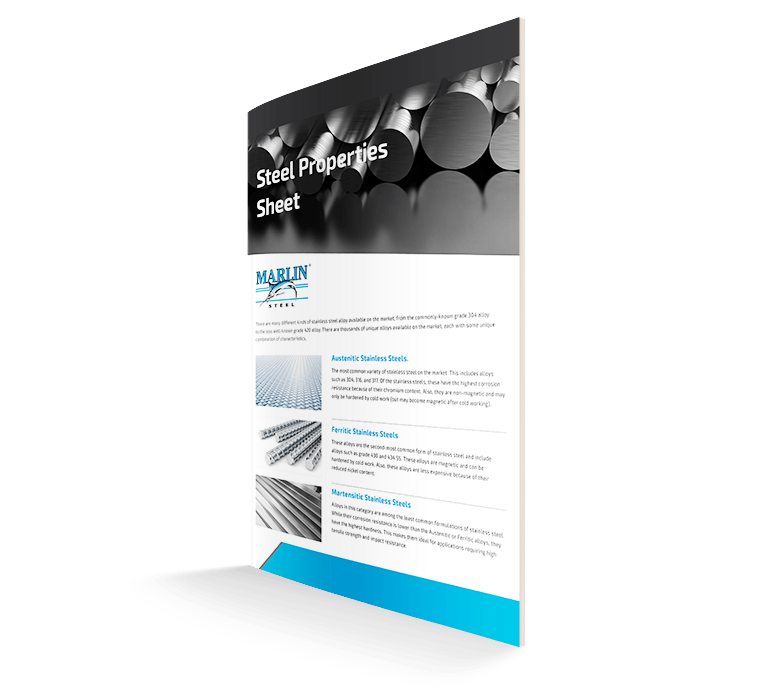 However, this situation changed when Marlin Steel began to adopt factory automation in an effort to improve precision in manufactured custom steel wire baskets. The introduction of wire bending robots and cutting machines moved workers away from the dangers of unspooling steel wire and repetitive motion stress injuries. Instead, workers could now assume a more supervisory role watching over manufacturing robots that could do the dangerous tasks for them. Almost overnight, the use of manufacturing robots cut workplace safety incidents to almost nothing. 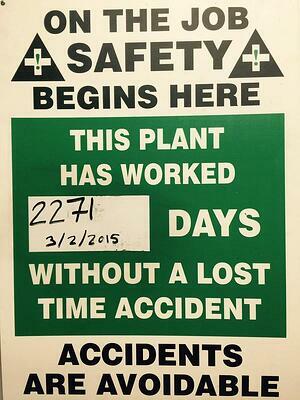 At the time of this writing, Marlin Steel has gone more than 2,350 days without a time-lost workplace safety incident. This is a massive change from the time where manual processing of baskets led to an accident every few months. Beyond simply assigning new safety rules and giving workers the tools they need to work safely, Marlin Steel also makes certain that each and every employee has undergone safety training for handling factory equipment. Each employee is put through a safety training course that teaches them not only how to safely work with the various manufacturing tools in the factory during normal operation, but how to handle emergencies where equipment may be malfunctioning. Learning to recognize when a piece of equipment is starting to go haywire and shutting it down quickly can mean the difference between a short loss of productivity while the machine is serviced and an on-site worker injury. Through training and skills building, Marlin’s workers are capable of working to recognize and remedy, or even prevent, equipment failures in a safe and timely manner. By emphasizing workplace safety, Marlin Steel’s workers avoid time-wasting safety incidents, keeping productivity up so that shipments of custom steel baskets can be made quickly and consistently. We're proud of the safe workplace we provide to our employees. See more about our safety award from OSHA here. For Marlin’s customers, this means fast, reliable delivery for basket orders. For employees, this means a safe workplace in which to work. For Marlin Steel, this means being able to keep talented workers for longer by minimizing the risk of injury or illness. In a safe workplace, everyone wins.